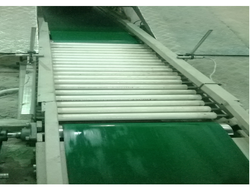 We are able to offer our prestigious clients a wide range of Check Weigher Conveyor System. Our range is used on automatic packing lines, where weights of the final products are to be critically and uniformly maintained. The offered range of products is conveniently stored the operational parameters of a number of products that can be recalled whenever desired. We are one of the leading organizations engaged in manufacturing, exporting and supplying of Inclined Cleated Belt Conveyor System. We utilized top-grade raw material for manufacturing this product so as to make it highly suitable for wide applications in numerous industries. It is used for conveying applications owing to its longer service life, high strength and robust construction. We are offering this product within affordable price range with assurance of on-time delivery in order to enhance clients' convenience. 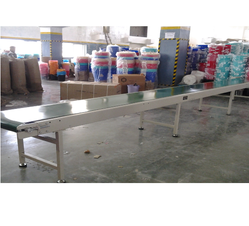 We are instrumental in offering a wide range of Packing Conveyors to the customers. Our qualitative range is an ideal choice for cartooning and manual labeling operations. Precision engineered, these products are manufactured using finest quality raw material to ensure its superior quality. The offered range can be easily used for delivering high performance in packaging. 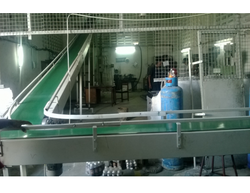 We bring forth for our valued clients a wide range of Gravity Roller Conveyor. 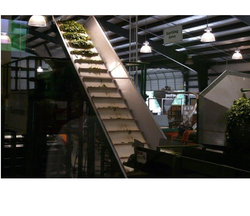 The offered range of products is non powered conveyors and is considered less expensive than others. These products are made using high-grade components by making use of latest tools & equipment. All our products are developed according to the demands of the customers. We have in store a wide range of Truck Loading Conveyor for our valuable clients. We provide these products at the customers destination within the promised period of time. Our range is available in different specifications and can also be customized as per their specifications. Highly demanded in various industries, these products are appreciated for its mentioned below features. 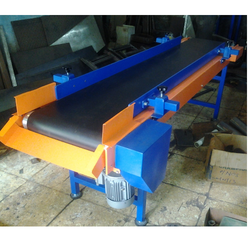 Customers can avail from us an impeccable range of Flat Top Modular Belt Conveyor. These products are made from high quality SS and MS with powder coating in order to ensure their corrosion resistance and durability. Our offered range is also available in different lengths and width to meet the variegated requirements of our customers. Description Available in various working lengths. Suitable for any diameter & weight of fabric roll. We are one of the leading organizations engaged in manufacturing, exporting and supplying of Horizontal Conveyor Systems. It is used for conveying applications owing to its longer service life, high strength and robust construction. These conveyors have hardened wheels that are sealed with bearings that run on Tracks . 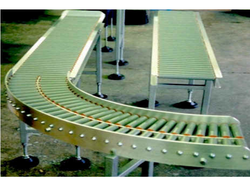 Our conveyors are extensively acclaimed for their robustness, longer functional life and durability. Inclined Cleated Belt Conveyors offered comprise high performance based conveyor systems that come in sturdy construction finish and find usage in heavy-duty applications involving movement of large/bulky items. 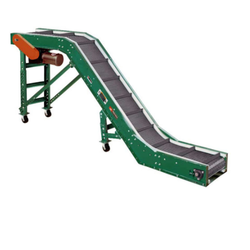 These conveyors also provide for high functional life and are perfect for use in processes involving movement of products in horizontal/inclined position. 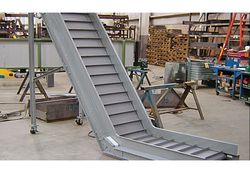 These conveyors are used for bridging the gap between any two conveyors at right angles to each other. 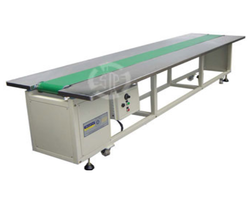 The type of conveyor to be used depends on the product to be conveyed. The 90 degree bend can be implemented with a minimum turning radius of width involved. 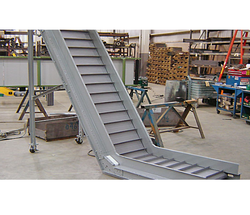 Roller conveyors at 90 degree bends can be designed with PU rope, chains for both tapered rollers and plain rollers. Systems have been developed to take turn at 1.5 times the belt width for modular belt conveyors. Special attachments like corner disc and magnetic corner track can be used for special applications in slat chain conveyors. 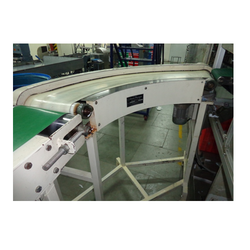 We are Specialist in Inclined Conveyor With Modular Cleated Sidewall Belt. We have in stores for our clients Modular Cleated Conveyor Belt System that are primarily utilized for controlling products on straight or inclined conveyors. For attaching the cleats to the belting material, we make use of proprietary in-house processes. 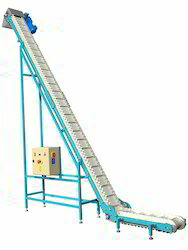 Looking for Industrial Conveyor System ?